Note: There were members unable to attend and are not pictured above. The Commission for the Cause and Charism (CCC) of Venerable Mary Angeline Teresa had their meeting at the National Shrine of Our Lady of Mount Carmel in Middletown, New York last September 17, 2016 to continue the work of advancing the Cause in Rome. The Commission is chaired by Very Reverend Mario Esposito, O.Carm. who also acts as the Vice-Postulator for the Cause. The CCC is made up of sub-committees with members responsible for planning events to promote Mother’s life and charism, to review and plan for the publications of The Mother Angeline Society, and to promote public awareness of Venerable Mary Angeline through education. 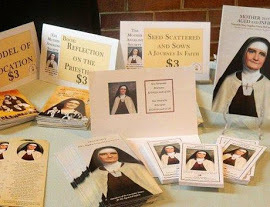 The CCC, primarily through the Office of the Vice-Postulator, receives and reviews favors answered through prayers addressed to Venerable Mary Angeline Teresa. To advance the Cause of Venerable Mary Angeline, we ask the faithful that favors believed to be received through her intercession, be reported to the Office of Vice-Postulator at 600 Woods Road, Germantown, NY 12526 or contact us. Next Post: From the Pen of Brother Robert Chiulli, O.Carm.